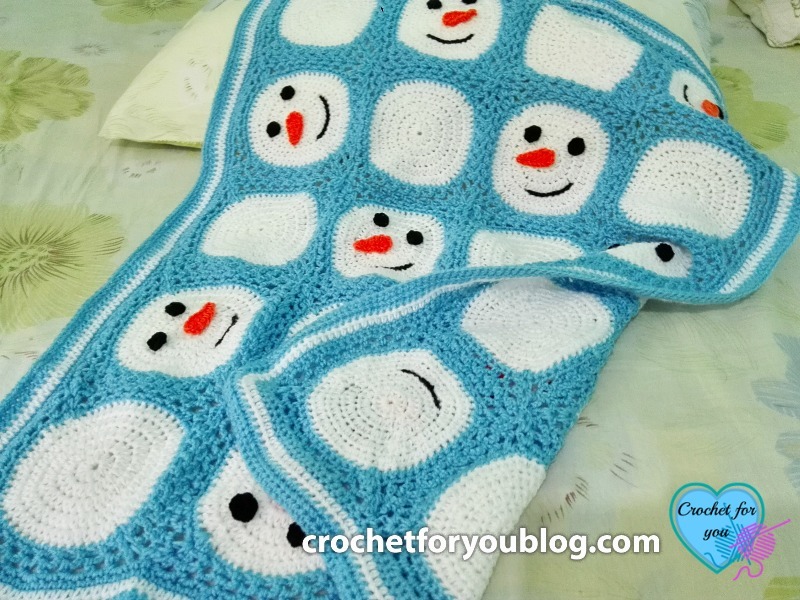 Crochet Snowman Granny Square and Blanket Pattern by Crochet For You. 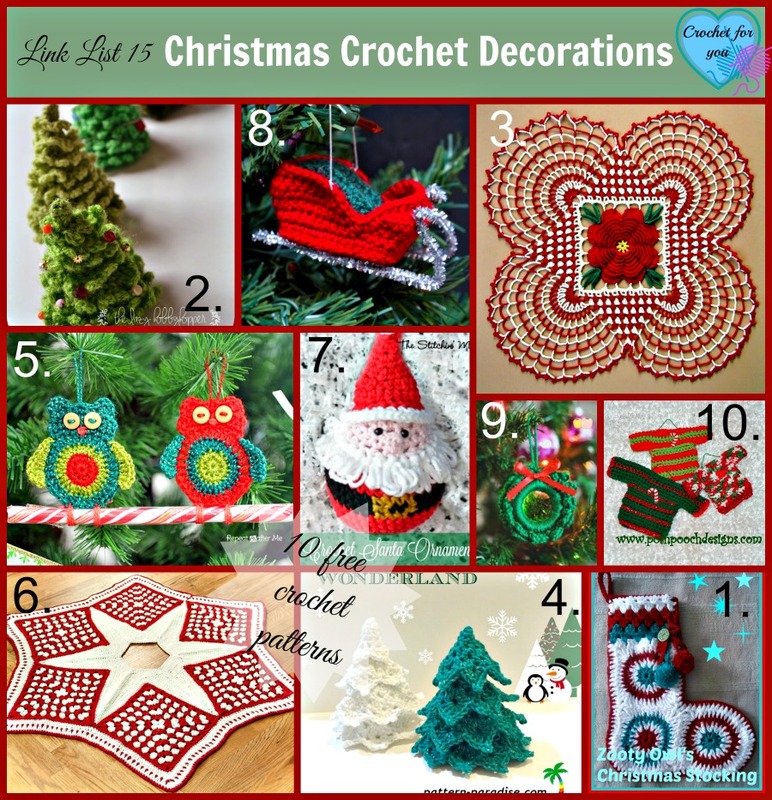 Crochet snowman patterns can be seen everywhere now. 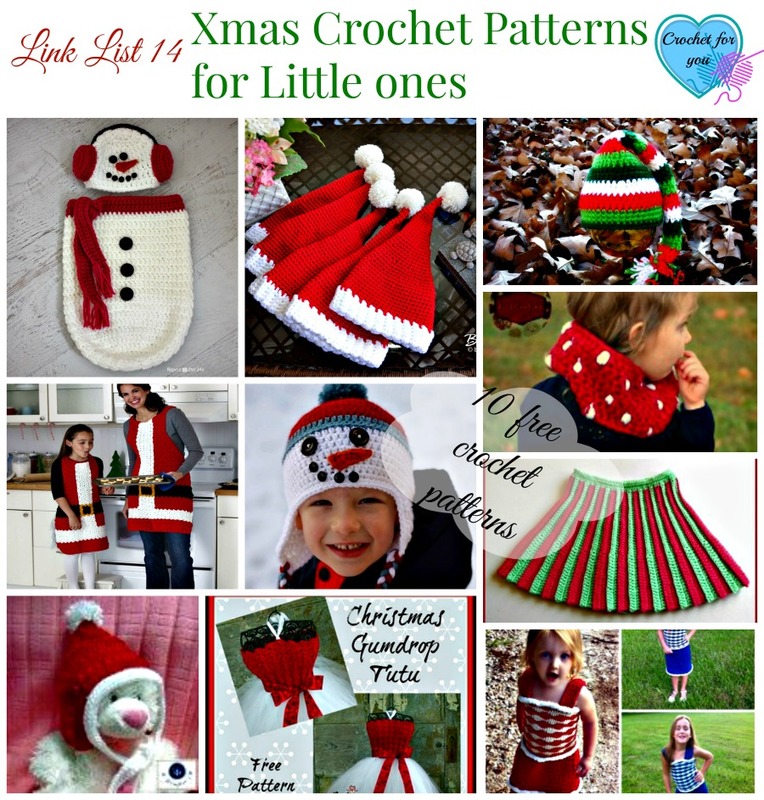 Snowman hats, ornaments, amigurumi, cup cozies, coasters and I also added a pin Snow Lady mittens to my Pinterest Board Christmas Crochet Patterns. But I didn’t see a snowman face on a crochet square?. 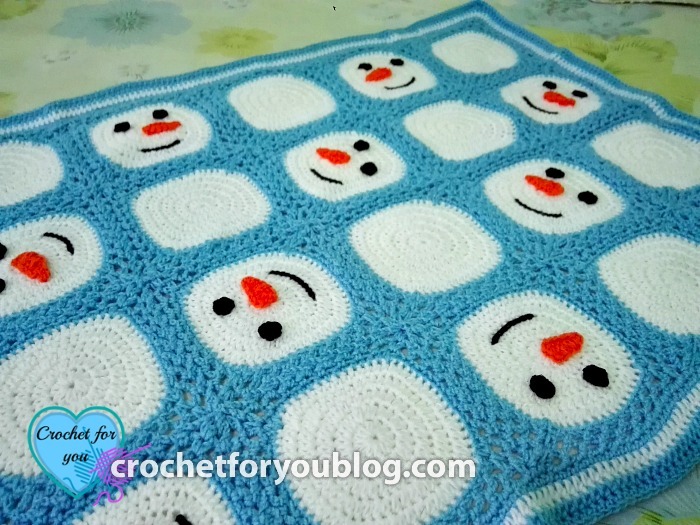 So I decided to make one granny square with the face of the snowman. 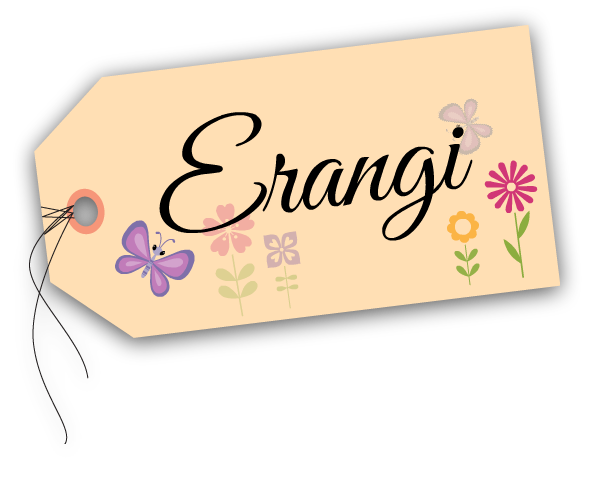 I got a few photos and make a photo collage using PicMonkey(see the photo below). Do you have any idea about this.. 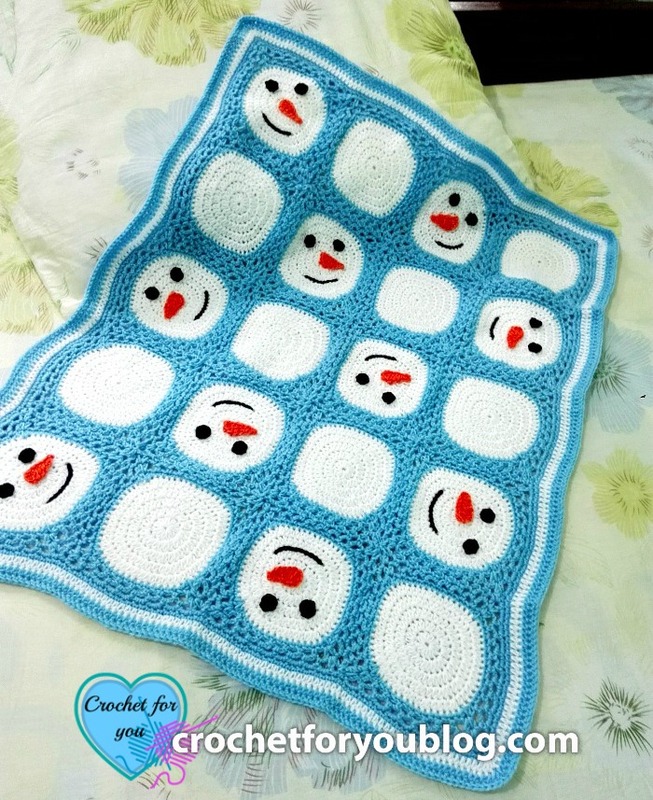 Yes.. We can make any size blanket or Afghan joining these snowman granny squares together. Woohoo.. These smiling snowy faces can stay looking at each other in this Christmas all the time. As shown above, I made this blanket with 20 squares joining together and attached eyes, nose, and mouth line onto the selected squares. Tapestry needle for weaving ends and attaching eyes and nose. Gauge 20 dc x 7.5 rows = 4” with 4mm crochet hook. * to * = work instructions within brackets as many times as directed. v-st = 1 hdc, ch 1, 1 hdc in indicated st.
ch 9 with orange color, sc in 2nd ch from hook, sc in next ch, hdc in next ch 2, dc in next 4 sts, fasten off. With black color, 8 sc into the ring, sl st to first sc, fasten off. Sew the eyes and nose onto the square. I used surface slip stitches to make a mouth line. Don’t you know what is the surface slip stitch?. If so click here and watch the video from Moogly to clear it first. Insert the hook from (RS) in any stitch on round 3 where you want to start, add a slip knot on the hook with black color and pull up a loop through the work, insert hook in next st hole, yarn over, pull through the work and the loop on hook at once, one surface slip stitch is completed, *insert the hook in next stitch hole, yarn over, pull through the work and the loop on hook at once* repeat *to* 8, 9 or 10 times. Joining as you go: You may already know how doing this, this is the easiest joining method for me. 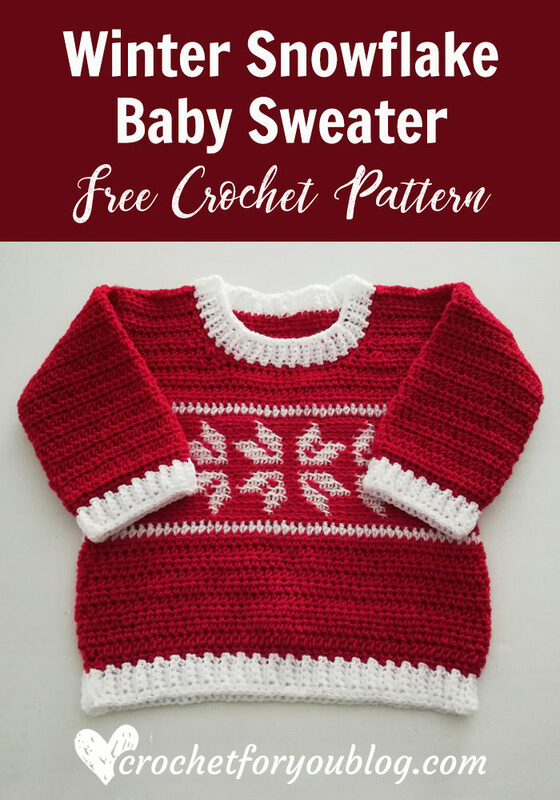 There is a great free online class on Craftsy (I have already enrolled) Amazing Crochet Textures (w/ Drew Emborsky to learn more about joining method. Make the first square with all rounds (1 to 8) and fasten off. 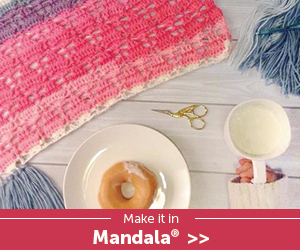 When you’re working on other granny squares after the first one, follow the instructions below for joining. 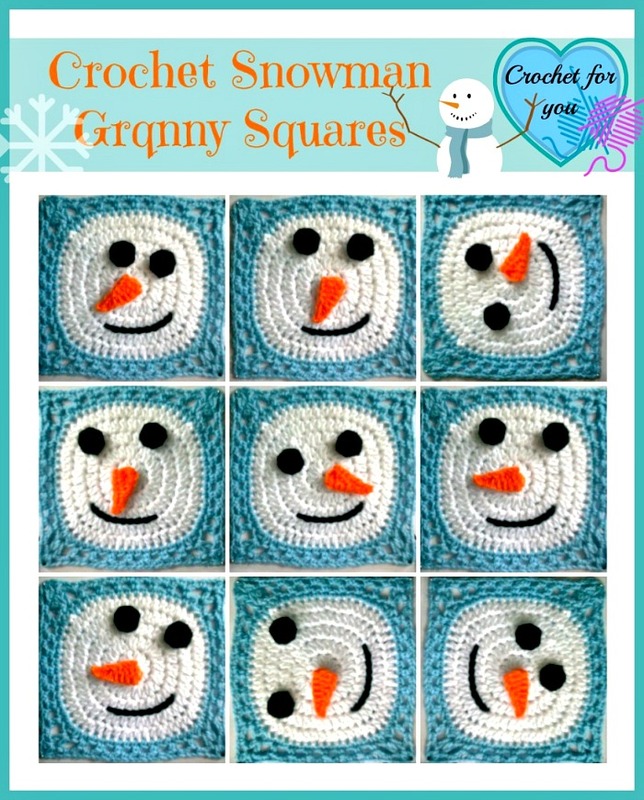 Follow the instruction of Snowman Granny Square rounds 1 to 7 and start to join in next round. ch 1, drop the loop off from the hook, insert the hook in next ch-3 sp of the previous square, pick up the loop and pull through the space, ch 2, work first hdc of the v-st in next ch-1 sp of the square we are working now, ch 1, drop the loop off from the hook, insert the hook in next corner ch-1 sp of the previous square, pick up the loop and pull through, ch 1, work rest of hdc of v-st in same ch-1 sp of the square we are working now. After finishing joining part, follow the instruction *to* in round 8 of the granny square and complete rest of the sides of the square. 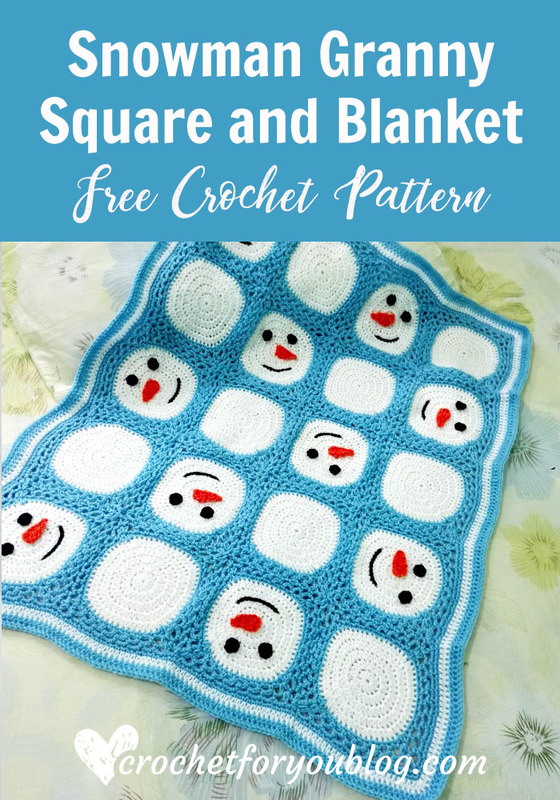 Join other squares as many as you want a row using this joining method. After making the first row of squares together, start to joining next rows of squares to the previous row one by one. Remember: when you reach to joining next rows of squares, you will have to join the 2 sides except first square (second and third …..). Round 1: (with blue) crochet 3 sc in each ch-3 sp around, and 3 sc in each corner. Round 2: sc in each st around. Look at the photo below. Round 3: (with white) hdc in each st around. Round 4: (with blue) hdc in each st around. Round 5: sc in each st around. Fasten off and weave the ends. I added a photo of the back of this blanket if you just curious about how it looks like. As you can see there is only can be seen surface slip stitches we used for mouth line. When attaching eyes and noses, I was careful to run the tapestry needle through the crochet stitches of the blanket and not to come needle out from the back side. Do you happen to have a picture of the back of the blanket? I’m just curious what it looks like. Thanks. Great job. I love snowmen. 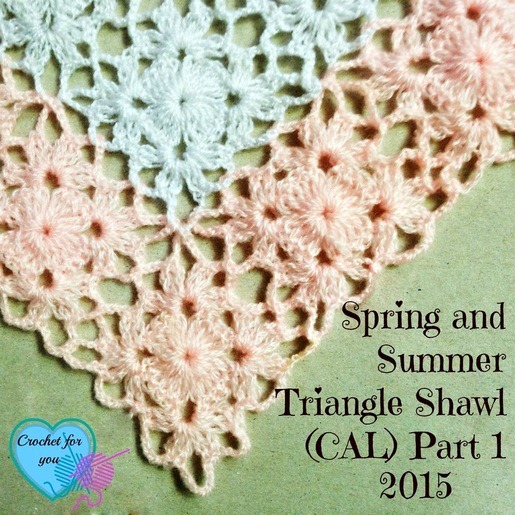 What size crochet hook did you use for the squares? I used 4mm G crochet hook because I made this blanket with sport weight yarn. What is a “magic ring” at beginning of pattern? I love this blanket! It would look cute for a poncho, too. Thanks! 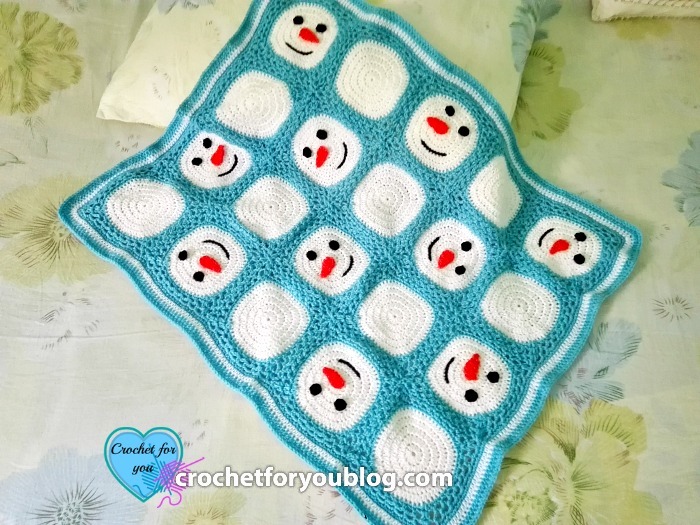 Just a little FYI…I found that when I crochet squares with faces, the other side kind of looks nasty. So I just crochet additional rounds of squares attach to backside and this makes the blanket look so much cleaner on both sides. 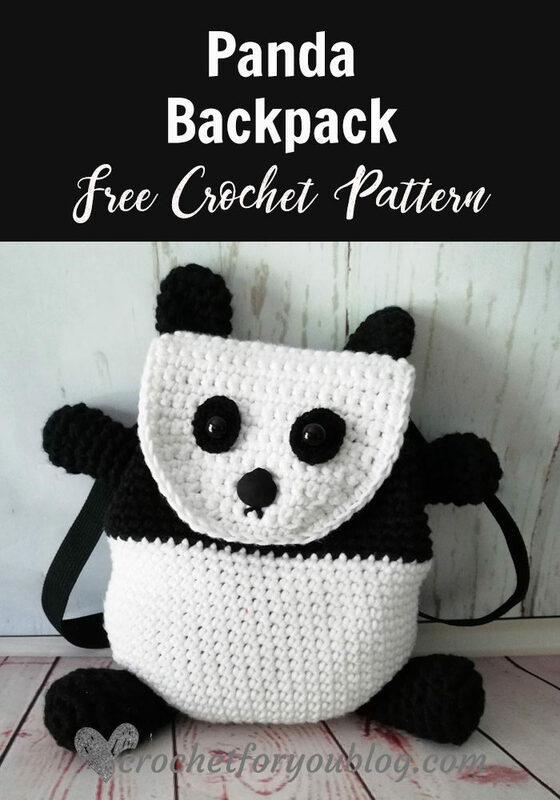 Adorable pattern! I just put the face on front and back of the blocks with faces so no worries about the way the back looks! Can you tell me what brand of yarn you used for this? Sorry, I used local yarns sell in my country and it is not a popular brand. 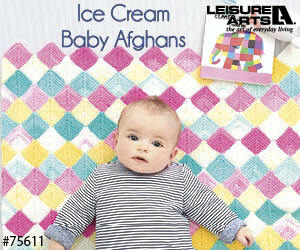 The weight of that yarn is sport and also you can use any yarn type for this blanket.